Do you yearn to travel but your budget won’t allow it? There’s nothing holding you back from bringing exotic tastes and experiences straight to your dinner table. This classic Moroccan dish will have you dreaming of the Casbah without leaving the comforts of your home. A traditional Moroccan couscous is prepared with simmering lamb, plenty of spices like cinnamon and saffron, and a generous helping of squash and peppers. Making the couscous in the kitchen with the help of family or for guests is a symbol of love, generosity and hospitality. Fluffing and breaking the couscous grains to add a puffy texture is the signature communal activity before enjoying this steamed dish. Enjoying family sized dishes is in the spirit of all Moroccan cuisine. This couscous is sure to be a hit around your household. Our recipe calls for plenty of delicious fresh vegetables and spices. We substitute the traditional roasted lamb with Randall Great Northern Beans to add protein to this main dish. No good couscous dish would be complete without a complementary acidic sauce, so we’ve included our take on a Tunisian favorite. The sauce is a perfect way to add a little kick to your couscous dish and adds another hint of color to the yellow couscous. Combine all ingredients and let flavors blend at room temperature. If not used within several hours, refrigerate and use within a few days. Bring water to a boil. Add salt and sprinkle in the grain. Simmer for 20 minutes, then pour through vegetable steamer lined with cheesecloth to drain. Mix in butter and hot pepper. Arrange vegetables over grain in steamer and steam until vegetables are quite tender, 20 to 30 minutes. While grain and vegetables steam, cook tomatoes with salt in small uncovered saucepan for about 10 minutes until liquid runs freely and tomatoes soften. To serve, transfer grain-vegetable mixture to a large serving platter and pour on tomatoes. Serve Spicy Tunisian Sauce on the side for seasoning. 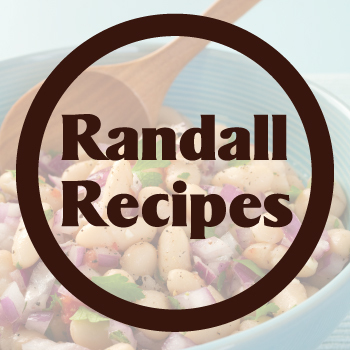 Summertime is the perfect time to try this tasty recipe featuring Randall Beans Great Northern White Beans.